Payoff Pitch Baseball offers a unique pitcher batter interaction that realistically replicates the game of baseball on the tabletop. Each at-bat starts on the pitcher card to determine the quality of the pitch and then flows to the batter card to resolve the at-bat. This is all done quickly and effortlessly with full nine inning games able to be played between 25 and 35 minutes even while keeping full statistics. The game can be played using dice and charts or with a deck of Fast Action Cards (FAC). Most at-bats are resolved with one roll of two six-sided (2d6) and two ten-sided (2d10) dice or with two cards when using the FAC. I believe the best way to explain how the game works is to provide examples of game play. I will use the 1979 Montreal Expos and 1979 Pittsburgh Pirates to do so. I will present the first six innings of the game. The first three will use the dice & charts and innings four through six will be played with the Fast Action Cards (FAC). I randomly choose Pittsburgh to be the home team. I rolled a six-sided die (d6) to determine which pitchers would be the starters. Dan Schatzeder started for Montreal with Jim Rooker starting for Pittsburgh. A quick note about the season set. Each season has two distinct sets available. One uses the players actual left / right split statistics to determine the ratings while the standard season set uses the players overall season stats. The standard set is used below. Rodney Scott leads off for the Expos. I rolled all four dice at the same time. The two six-sided dice (2d6) totaled 7 while the two ten-sided dice result (one white and one black with the white being the 10s and black being the 1s) was 32 (3 on the white die and 2 on the black die). The result next to 7 on Rookers card is IN-PLAY. IN-PLAY means Scott was able to put the bat on the ball and it was hit into the field of play. We look at Scotts IN-PLAY section of his batter card and see 32 is outside the range of numbers (1 to 26). Since 32 is higher than the range of numbers in his IN-PLAY section, we find 32 in the ranges listed on the bottom of Scotts card to determine the type of out that was made. Scott has a range of 32-33 next to P5 meaning Scott popped out to the third baseman. Both Scott and Rookers cards are displayed below. This game is using the standard season set that bases the players ratings on their overall stats. Warren Cromartie is next. 2d6 = 9; 2d10 = 23. Rookers card again yields the IN-PLAY result; however, this time the 2d10 roll of 23 falls within Cromarties 1B range meaning Cromartie singled. With Cromartie on first base, Andre Dawson is up (2d6 = 7; 2d10 = 17). Dawson with another single that moves Cromartie to second with one out in the inning. Larry Parrish is next up and pops out to first base. With two outs and Ellis Valentine at the plate, the 2d6 result is 6 and Rookers card result is TOUGH. This means Rooker made a good pitch that could possibly result in a strikeout. The 2d10 result is 95 and greater than the ranges listed in the TOUGH section of Valentines card meaning Valentine avoided striking out, but an out has been made. 95 falls within the F7 range for a Flyout to the left fielder. Omar Moreno leads off for Pittsburgh. The 2d6 = 4. The 4 result on Schatzeders card is WHEELHOUSE. This means Schatzeder put the pitch exactly where Moreno likes it and there is a chance of a homerun. The 2d10 result of 26 would mean a homerun for most hitters, but Moreno only hit 8 HR in 695 AB in 1979 and 26 falls within his 1B range. A lead off single for Moreno. Tim Foli follows Moreno. 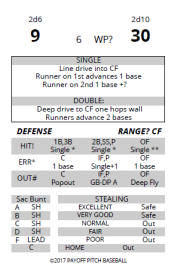 For this game, I am using the auto sacrifice bunt and auto stolen base options provided in the game instructions. The 2d6 result is 9. Since I am using the auto sacrifice option, I first check Folis Sacrifice rating, 9 11. Since 9 is in the range listed, Foli is attempting to sacrifice bunt and move Moreno to second base. 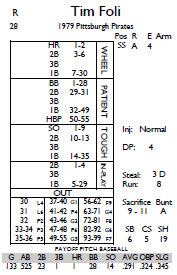 We ignore the result on the pitcher card and instead refer to the sacrifice bunt chart included with the game and roll the 2d10. The result is 20. We look under the A column (Folis bunt rating is A) and find the range that contains the number 20 and see the result is listed as SH. This means Foli has successfully sacrificed himself and Moreno moves to second base. Dave Parker steps up next and flies out to center field. With two outs and Moreno on second base, Bill Robinson steps into the batters box. The 2d6 roll is 2 for a result of DEFENSE on Schatzeders card. When the DEFENSE result comes up, instead of going to the batter card, we instead go to the DEFENSE chart. The 2d10 result of 70 is in the range of 58 72 under the ERROR? column and next to 3B. This means we will be checking the third baseman, Larry Parrish, to see if an error was made. 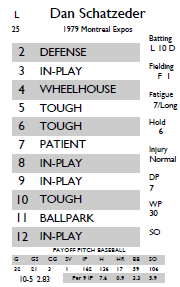 Re-roll all four dice and refer to the ERROR section of the ballpark chart. Parrish has a 1 error rating at 3B so look under the 1 column. The 2d10 result is 60 which results in ERR*. Now we find the 2d6 result of 10 on the included ERR* chart. Reference the middle column that includes the 3B position and the 2d6 result of 10 to see that Parrish made a 1 base error. This allows Moreno to advance one base to third with Robinson safe at first on the error. That should have been the third out, but extends the inning and brings up Bill Madlock. The 2d6 roll equals 11 which gives the BALLPARK result. When this result comes up, we check the ballpark chart to determine if the WHEELHOUSE or IN-PLAY section of the batter card will be used. 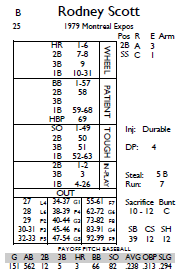 Madlock is a right-handed batter (RHB) so we use the right side of the BALLPARK chart and see that on a result of 1 23, the WHEELHOUSE section will be used while 24 99 means we will be using the IN-PLAY section of Madlocks card. The 2d10 result is 85 and off to Madlocks IN-PLAY section we go. Re-roll the 2d10 and the result is 03 for a 2B. This means Madlock has smashed a double scoring Moreno from third. The basic baserunner advancement instructions indicate runners advance the same number of bases as the hit, so Robinson moves from first to third; however, there are two outs so all runners advance an extra base and Robinson scores. Phil Garner ends the inning by popping out to the first baseman. Gary Carter grounds out to third base and is followed by Tony Perez who grounds out to the short stop. Another TOUGH result on Chris Speier who flies out to center to end the top of the 2nd inning. Steve Nicosia flies out to right field and Lee Lacy bounces out to third base. Pitcher Jim Rooker follows with a single. Moreno makes his second plate appearance of the game next. The 2d6 = 7 which gives the PATIENT result. This means either Schatzeder is missing the plate with his pitches and/or Moreno is being selective at the plate waiting for a strike before swinging. The 2d10 result is 28 which falls in the 1 32 BB range. Moreno has drawn a walk putting runners on first and second base with two out. Foli follows and gets the first TOUGH result off Schatzeders card. Foli is very difficult to strike out though (only 14 times in 525 at-bats) and the 2d10 result of 69 is higher than the ranges listed in Folis TOUGH section. Instead, we find 69 is in the G4 range of 63 71 and Foli has grounded out to second base to end the inning. Larry Parrish follows with a single from his IN-PLAY section scoring Schatzeder from third base. Since there are two outs, Dawson advances two bases on the hit. Valentine becomes the games first strikeout victim when the 2d6 yielded a 10 for a TOUGH result and the 2d10 = 11. The first roll of the bottom half of the inning is 2d6 = 4 and 2d10 = 73. Checking Schatzeders card, 4 is a WHEELHOUSE result meaning he grooved one down the middle of the plate to Dave Parker. 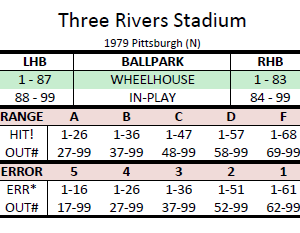 We look for the 73 result in the WHEELHOUSE section of Parkers card, but it is higher than the ranges listed and we look at the OUT section at the bottom of Parkers card. 73 is in the G6 range within the OUT section. Parker missed a good pitch to hit and grounds out to short for the first out of the inning. Bill Robinson steps up next and again the 2d6 total 4 for the WHEELHOUSE result. Robinson has a higher range of numbers in his WHEELHOUSE result and the 2d10 roll of 56 falls in between his HR range of 1 66. Robinson hits a solo shot and puts the Pirates up by two runs (3 to 1). Bill Madlock singles on an IN-PLAY result. Another IN-PLAY result greets Phil Garner (2d6 = 3; 2d10 = 92). The result is G6. We check for a double play since there is a runner on first base and less than two outs. The 2d6 on the table total 3 (again, no re-roll) which is less than both Schatzeders DP rating of 7 and Garners DP rating of 4. Since 3 is lower than both 4 and 7, the Expos have turned a double play to end the inning. Before starting the 4th inning, I switched from using the Dice & Charts to the Fast Action Card (FAC) system. A sample card is shown below. The top of the card shows the initial dice rolls and the rest of the card replaces most of the charts used in the dice & charts version of the game. To use the FAC, first turn over the top card and refer to the 2D6 number. This is the number to reference on the pitcher card to determine the BALLPARK / DEFENSE / IN-PLAY / PATIENT / WHEELHOUSE result. Then turn over the next card and refer to the 2D10 number and the batter card to resolve the at-bat. The first FAC 2D6 result is 6. Rooker has TOUGH next to 6 so we look at the TOUGH section of Gary Carters card and turn over the next card. The 2D10 number is 45 which results in SO, a strikeout. Tony Perez follows with another strikeout and Chris Speier also has to use the TOUGH section of his card, but manages to fight off a good pitch by Rooker and fly out to center field to end the inning. With three TOUGH results in a row, Rooker seems to have settled down after a shaky 3rd inning. The FAC continue to be pitcher friendly as both Steve Nicosia and Lee Lacy have to use the TOUGH section of their cards. Nicosia grounded out to the short stop while Lacy was able to fight off a nasty pitch from Schatzeder and hit a single. The pitcher Rooker bunted Lacy over to second to bring up Moreno. An IN-PLAY result and 93 on the 2D10 section of the next FAC resulted in a fly out to right field to end the inning. Rooker retired the Expos in order coaxing a ground out by Schatzeder, a fly out to right by Scott, and striking out Warren Cromartie. Tim Foli leads off the inning for the Pirates. The 2D6 number is a 2 for a DEFENSE result. Because the result on the pitchers card was DEFENSE, we check the middle of the next FAC. In the middle of the card in bold we see the word DEFENSE on the left side of the card and RANGE? SS on the right side of the card. We will be checking the range of the short stop to determine the result of the at-bat. Chris Speier is the short stop for Montreal and has a range rating of A. Turn over the next FAC and find the 2D10 number on the FAC. Look for this number under the A column in the RANGE section of the ballpark chart. The 2D10 number is 5 and falls in the range of 1 25 for a result of HIT!. Turn over the next FAC and look under 2B, SS, P in the HIT! section of the FAC (the middle of the card). The result in the HIT! section is Single*. This means Foli has hit the ball out of the reach of Speier and is safe on first with a single. Any runners would advance 1 base (the number of the * shown). Since Foli is leading off, there are no runners on base prior to Foli getting a hit. Dave Parker and Bill Robinson both hit into fielders choices before Madlock grounds out to third base to end the inning. Rooker had some problems in the first few innings, but has retired the last seven batters in a row, four by strikeout. That quickly changes as Dawson and Parrish both single. Valentine and Carter follow with fly outs to bring up Tony Perez with two outs and runners on first and second base. Another IN-PLAY result (the 5th of the inning), but this time the 2D10 number on the FAC is 7, the last number in Perezs 2B range. Both Dawson and Parrish score (runners advance 2 bases on the double and an extra base with two outs) to tie the game at 3 runs apiece. Enrique Romo relieved Rooker and retired Speier on a grounder to short. Phil Garner leads off and gets one in the WHEELHOUSE, but doesnt take advantage of it and grounds out to third base. Steve Nicosia avoids a strikeout in his TOUGH section and flies out to center field. Lee Lacy is up next. The 2D6 number from the first FAC is 9, the next FAC shows 0 under 2D10. This means we head to the RARE PLAY chart (any time the 2d10 number is 00 or 0, ignore everything else and go the appropriate RARE PLAY chart). Since there is no one on base, we will use the BASES EMPTY chart. The result next to 9 is HBP, brawl erupts. Lacy takes first base with the relief pitcher Romo up next. Since this is 1979 and Romo is a #7 (out of 16) hitting pitcher, Romo is allowed to hit for himself. That turns out to be a good decision as the FAC give a 2D6 number of 9 (IN-PLAY) and then a 2D10 number of 1 resulting in a 2B (double) scoring Lacy. Schatzeder then walks Moreno for the second time in the game before exiting the game and being relieved by Stan Bahnsen. The FAC reveal a 2D6 number of 5 for a TOUGH result. Foli is the perfect guy to have up as his SO range is only 1 9. The next FAC is turned over and the 2D10 number is 35 the last number in the 1B range of 14 35. Instead of getting the final out on a good pitch, Foli slaps a single scoring Romo and moving Moreno to third base. Dave Parker checks his PATIENT result, but the 2D10 number of 68 is just outside the range and Parker grounds out to short to end the threat and inning. Well leave the game there with the Pirates holding a 5 to 3 lead with three innings left to play. As noted above, I used the standard version of the player cards. There is no left / right split ratings in the standard set, but actual left / right split ratings are used in the Splits set. I also only used the basic runner advancement rules. While it did not come up in the game above, there are possibilities to attempt an extra base on a hit using the runners RUN and fielders ARM ratings. A hit location chart is also included in the dice & charts version of the game. 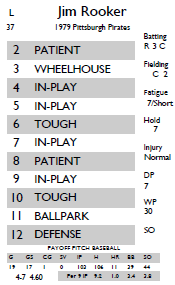 The FAC version lists the type of hit, fielder, and bases to advance in the top section of the card under the 2D6 and 2D10 numbers. There are a few different options included in the instructions for stealing and bunting. I used the auto system for both in the game above, but there are also instructions for calling your own steals / bunts and an option to get a jump before attempting a steal. For those that enjoy drafting your own teams, the player cards have been normalized to allow for draft leagues and playing teams from different eras while still producing realistic results. If you have any questions or comments regarding the game or samples posted above, please feel free to contact me using the Contact menu option above.